New York Times article about the sale of this stamp, position 57. Jenny Invert Blocks Bring Over $2.5 Million! In a scene reminiscent of the 1940s, one of America’s legendary philatelic rarities traded hands in bulk quantities in May. Dallas auctioneer and dealer Charles Shreve brokered a lot of three Jenny Invert blocks of four, purchased from New York dealer Harry Hagendorf of the Columbian Stamp Company. They were sold to a private West Coast collector for a price in excess of $2.5 million. Only one sheet (of 100) of the famous invert was ever found. It was purchased at a Washington D.C. post office by William T. Robey in May 1918. Robey sold the pane almost immediately to Philadelphia dealer Eugene Klein for $15,000, yielding a rather handsome return on his original $24.00 investment. Klein in turn sold the pane to the eccentric millionaire Col. E.H.R. Green for $20,000, who then broke it up. Retaining the plate block of eight, the centerline block, the siderographer and the left arrow block, Green disposed of most of the remaining stamps for between $250 and $650 each. After Green’s death in 1936, his collection was dispersed through a series of auctions in the 1940s. Most of the single straight-edge and faulty copies sold for between $750 and $1,750. New York dealer Y. Souren purchased the blocks at various prices between $13,000 and $27,000. During the 1950s and 1960s, the blocks continued to trade among the philatelic elite, including the Weill brothers of New Orleans, the Lilly Family, Robert A. Siegel and H.R. Harmer Inc. In the early 1990s, Hagendorf began accumulating the known C3a blocks, purchasing two from a Christie’s auction in September 1991, and one from Superior in October of the following year. All three blocks were purchased between $500,000 and $700,000. Hagendorf added a fourth block to his holdings with a recent purchase of the Princeton Block from a private collector. Hagendorf also sold this block in May 2002, though it was not a part of the transaction with Shreve.So, for an issue that typically trades only several times per decade, May 2002 witnessed the sale of an incredible sixteen Jenny inverts – four of the six known blocks. In 1996 The National Postal Museum, Smithsonian Institution presented an exhibit of the Inverted Jenny’s. At that time I loaned the Museum three of the six known blocks. The catalogue is reprinted here with permission of the National Postal Museum. 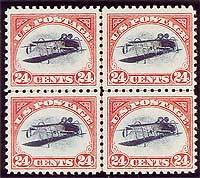 The Philatelic Foundation Quarterly Published in 1991 (Volume 9, Number3) wrote a wonderful monograph on the Inverted Jenny Scott C3a. With grateful permission from the Philatelic Foundation it is reprinted here.